Browse our guitar straps. Made from the highest quality materials. Double Treble Guitar Straps is proud to introduce a new EXCLUSIVE line of straps, designed by Billy F Gibbons, the world renowned guitarist of ZZ Top. The straps are individually hand made in the USA. 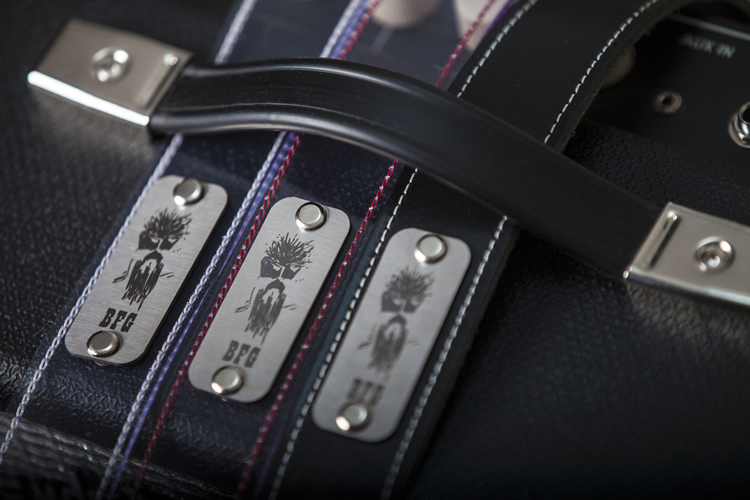 Each of these straps are end-riveted with a special identification steel badge showcasing BFG's personal caricature. The strap is delivered in a sturdy, stainless steel casing can for protection and storage. These exceptional guitar straps have it all, style, craftsmanship, and presentation and are now available to guitar slingers everywhere! 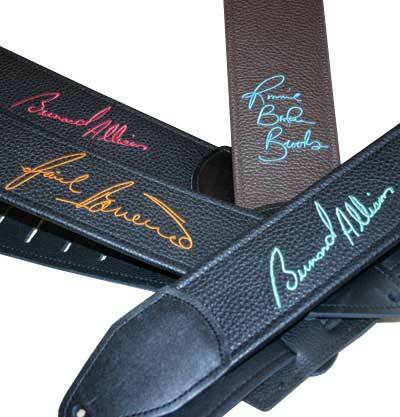 Our signature guitar straps and drumsstick bags are custom made, embroidered replicas of your signature. Every strap is hand crafted with folded edge construction of the finest garment quality calfskin. 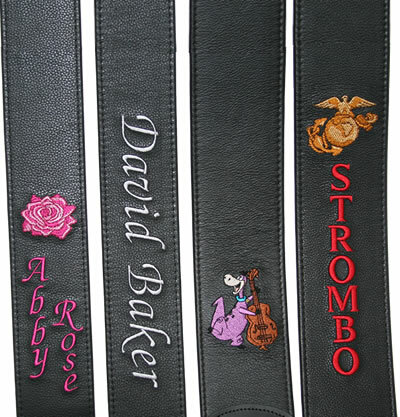 We are the original developers of the custom embroidered leather guitar strap. Often imitated but never duplicated! Every strap is hand crafted with folded edge construction of the finest garment quality calfskin, front and back. Unsurpassed embroidery and careful attention to detail is what makes our embroidered straps the best. If you're looking for a new and exclusive line of leather guitar straps, welcome to your perfect slice of heaven. With Billy F Gibbons leather creations you are bound to turn heads and stand out from the crowd. 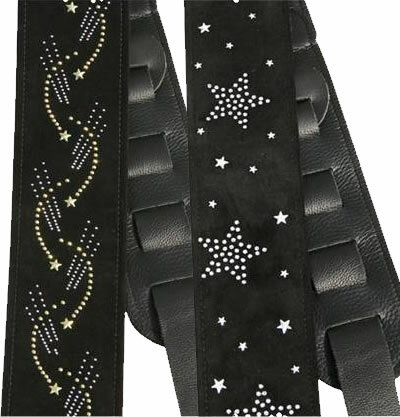 With our stunning Custom Guitar Straps you should be ready to take your musical image to the next level with this array of cool and exciting leather guitar strap designs. All leather straps are individually hand made in the USA and are end riveted with a special identification steel badge, which showcases the personal caricature. Instead of making do with a plain and simple style, you need to take not of the array of leather guitar strap designs we can make for you. The skill and craftsmanship that goes into each leather wonder is astounding and always leaves our customers with a smile on their faces. The robust and long lasting nature of our leather guitar straps make them unique to any other; you know you are going to have a strong leather strap to last you a lifestyle. When you order your leather guitar straps you will be blown away by the quality and versatility we can offer. 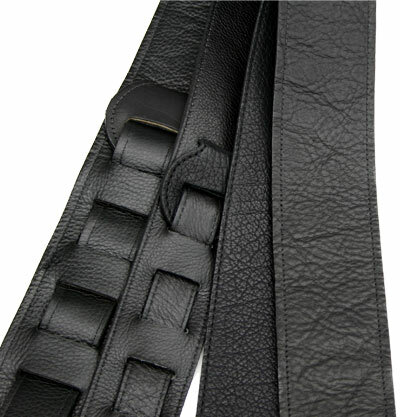 All leather straps are adjustable from 45'' to 52'' in lengths. Custom lengths for our leather straps are also available on request as well as our Custom Drum Stick Bag for an added touch of rockstar. 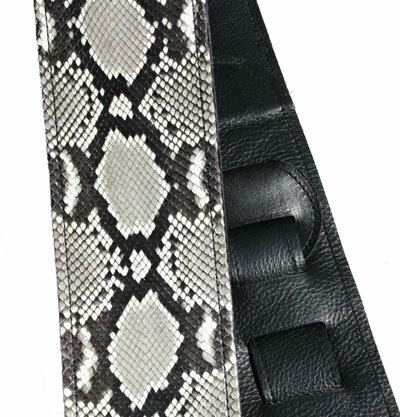 Leather guitar strap designs don't often come in such a plethora of eye catching styles. The leather guitar straps will also be delivered to you in a sturdy stainless steel casing can for ultimate protection and storage. Start exploring our leather guitar strap designs today and you will soon have a unique creation that you personally designed.